Located on the Merced River in Yosemite Valley with an unusual name, Housekeeping Camp straddles the line between camping and hotel accommodations and inspires fierce loyalty among park visitors. With amenities not usually found in campsites such as three walls, a canvas roof, beds, electrical lights and outlets, as well as standard amenities of picnic table and campfire ring, Housekeeping Camp is perennially popular with visiting families. Many of these families return year after year to the same units for easy access to the Merced River’s sandy beaches and activities like rafting and swimming. By examining the origin of Housekeeping Camp and its odd configuration and designation, it is apparent that this particular type of Yosemite accommodation has had great influence on the evolution of national park campgrounds as we know them today. In the 1860s, after the signing of the Yosemite Grant by President Abraham Lincoln, the State of California administered Yosemite Valley and the Mariposa Grove as precursor to the establishment of Yosemite National Park. The state instituted the designation of numbered camps in Yosemite Valley to indicate where visitors were setting up camp during their visit. By 1878, the idea of a public campground had taken hold and The Harris Camp Ground located near the present-day hotel, The Ahwahnee, was the forerunner of the current configuration of a national park campground. By 1918, a map of Yosemite Valley indicates Camp 19 as the first Housekeeping Camp and by 1920, the park concession was charging a fee for supplies to be provided to campers who needed equipment. Visitors who brought their own went to the free campgrounds, and visitors who rented supplies stayed in a “Housekeeping Camp” – meaning you kept your own house with no maid service. Housekeeping Camp was indicated at its present location as Camp 16 on a map in 1921 and remained designated Camp 16 until the 1970s. In 1923, Yosemite’s most influential concession operator, the Curry family, established Yosemite’s first lower-cost Housekeeping Camp with unfurnished lodging and no meals. This iteration included 10 units and was located in the current employee housing area known as Tecoya dormitory at Yosemite Village. 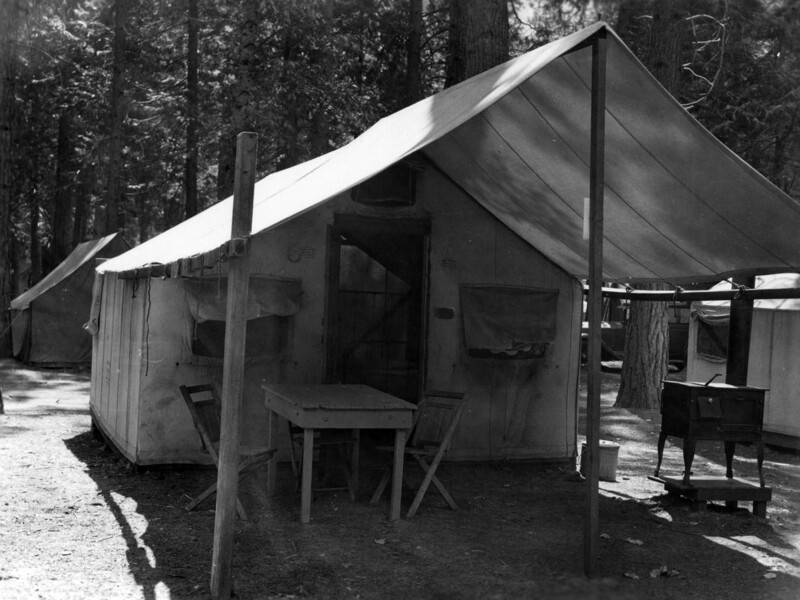 In 1943, a Yosemite park map stated that Housekeeping Tents at Camp 16 come completely furnished from $2.25 daily and $10 weekly – what a deal! 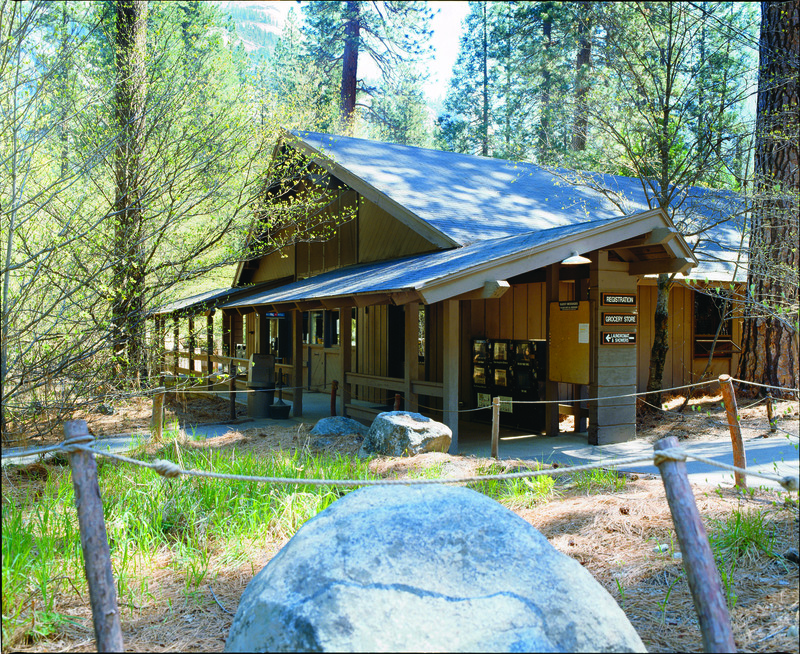 Ten years later, Housekeeping Camp was no longer considered a Yosemite campground, instead being listed as accommodations similar to Curry Village tent cabins. Amenities such as laundry facilities and a store were also available by the 1950s. Yosemite’s housekeeping camps were the beneficiaries of the Mission 66 program where significant funds were invested in the infrastructure of national parks from 1956 to 1966. As a result, in the 1960s, the units were constructed as we know them today with concrete slabs. Two units were built back to back as a duplex. The dividing walls and two side walls were concrete slabs mixed with a conglomerate of Merced River stones. The ceiling, front walls and two side walls were canvas with a nylon fly for protection from sun or rain. The patio kitchen was furnished with a wood-burning stove referred to as a ‘sheepherder’ stove. This experimental design for improvement of guest accommodations in Housekeeping Camp was developed with much thought by Yosemite Park & Curry Company’s Gordon Warren, responsible for the construction of the new units, and architects from the firm Spencer and Lee, among others. In 1964 the ‘laundromat’ building was added to house coin-operated washers and dryers, along with a new shower house. By 1976, the rest of the campgrounds in Yosemite were operated by the National Park Service. As the only remaining example of a ‘housekeeping camp’, Camp 16 was renamed accordingly and continues to be known as Housekeeping Camp to this day. Sometime in the 1990s, the old sheepherder stoves were replaced by campfire rings. Over time, the number of units have been reduced and the current Merced Wild and Scenic River Plan calls for the removal of more. 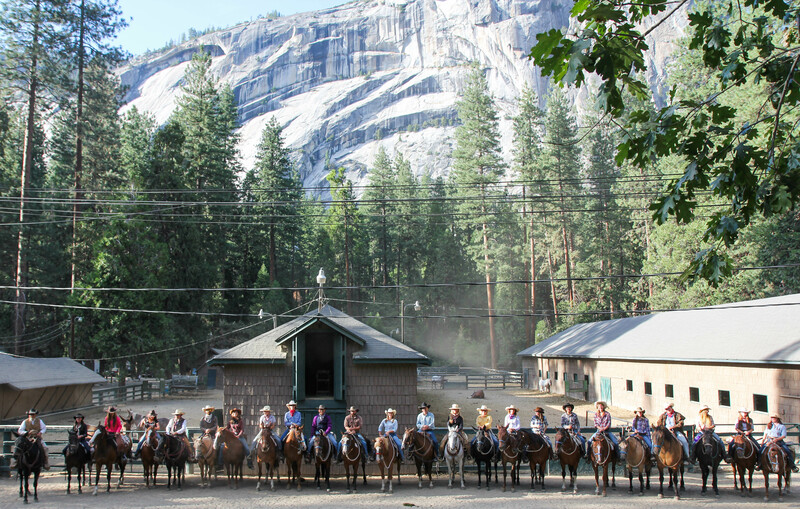 But for now, you can enjoy 266 units in the heart of Yosemite Valley for a camping experience without all the gear. Housekeeping Camp opens for the 2014 season on April 17th and still offers supplies in the form of bedpacks consisting of 2 sheets, 2 blankets and 2 pillows rented for $2.50 per night – subject to availability. Make reservations online or call 801-559-4884 to speak with a reservation agent. Where do you prefer to stay when you visit Yosemite? The Merced River Plan that is underway in Yosemite calls for some changes in the lodging and camping options. Increase the number of campsites by 28% across all river segments and 37% in the Valley. That means an additional 160 campsites. Merced Lake High Sierra Camp decreases from 22 units (60 beds) to 11 units (42 beds). Remove 34 units from Housekeeping Camp that are in the ordinary high-water mark. Some tent cabins in Curry Village would be replaced with hard-sided cabins and the total number of overnight units will be reduced by 50 at Curry Village. There are 400 units at Curry Village mentioned in the Merced River Plan, but this does not account for the 103 units that were approved exclusively for NatureBridge and subsequently made available for public use. 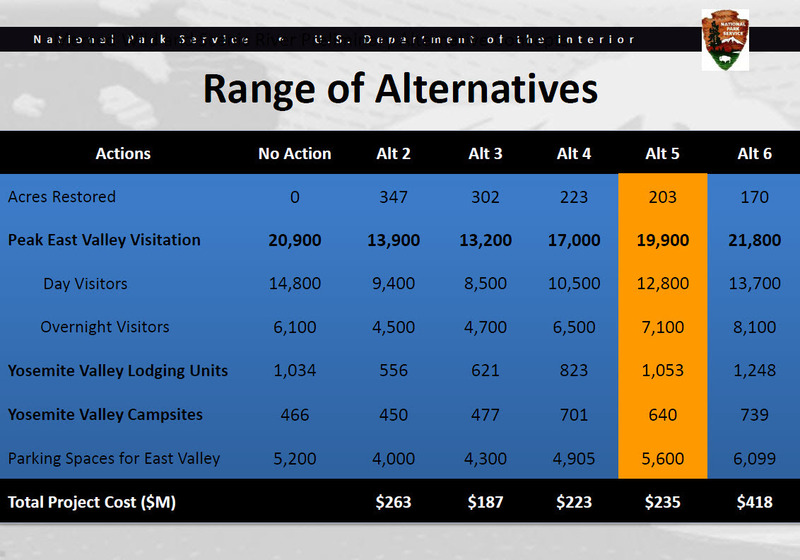 The Ahwahnee, Yosemite Lodge at the Falls and Wawona Hotel would remain the same under the preferred alternative, although some of the other alternatives propose changes at Yosemite Lodge ranging from increasing units there to eliminating them entirely. Submit a comment to the National Park Service. The comment period is open until April 18, 2013. Your comments matter. Public input has strongly helped to shape the draft plan, and it’s important for everyone to continue to provide feedback for the next phase as planners develop a final plan. Learn more about the Merced River Plan. 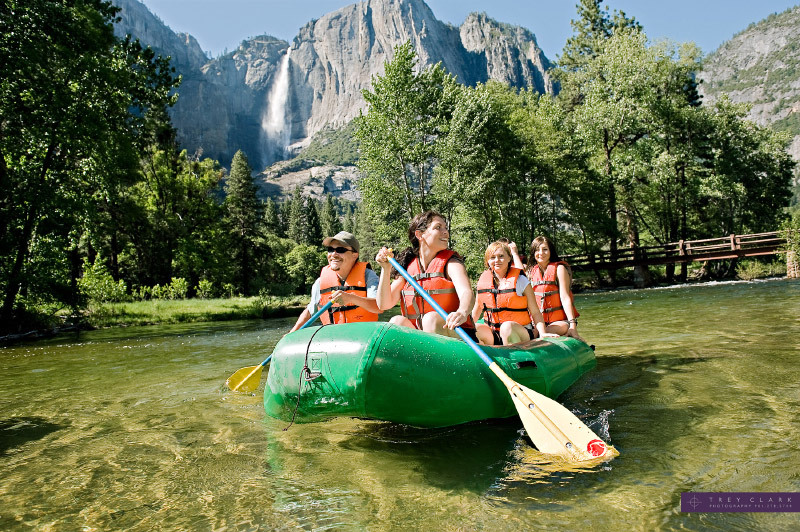 Have you ever taken a leisurely float down the Merced River in Yosemite Valley? As you may have heard, the park is currently working on a plan for the Merced River that calls for a change in the way visitors use the river in Yosemite. River rafting is a popular way to cool down on a summer afternoon while enjoying some of the iconic sights from a unique perspective. How many people can enjoy the river at once without over-crowding it and harming the ecosystem? 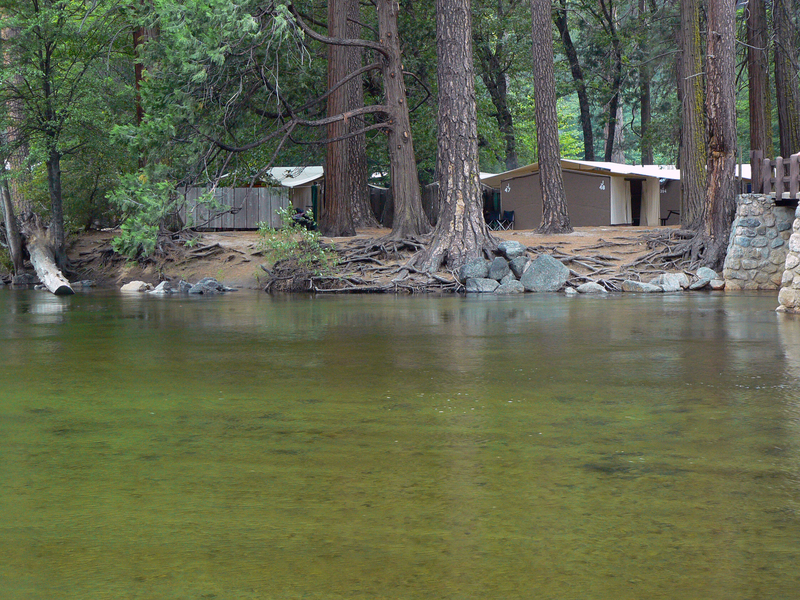 In the draft version of the Merced River Plan, the preferred alternative calls for the removal of raft rentals, and proposes a permit process for private rafts and flotation devices. Because different sections of the river have different designations, the number of permits would vary depending on which section of the river you’d like to be on. In Segment 2, the section that includes Yosemite Valley, the plan calls for restricting boating to 100 people per day using private vessels only on specific stretches of the river. You can review rafting details for the Yosemite Valley segment in the draft plan (pdf) on p. 8-250, and justifications for some of the proposed changes are in a table on page 8-260. The Preferred Alternative of the Tuolumne River Plan calls for removal of about 38% of the popular lodging at Glen Aulin High Sierra Camp, from 32 beds down to 20 beds. The reduction is an attempt to bring the camp into better alignment with the septic system capacity. Yosemite’s High Sierra Camps (HSC) give people an opportunity to enjoy the backcountry without having to carry a large pack. The Glen Aulin HSC is located along the Tuolumne River, and is situated next to the pool below 80 foot high White Fall, and visitors enjoy watching the sun set from a nearby promontory with a view of Mt. Conness. 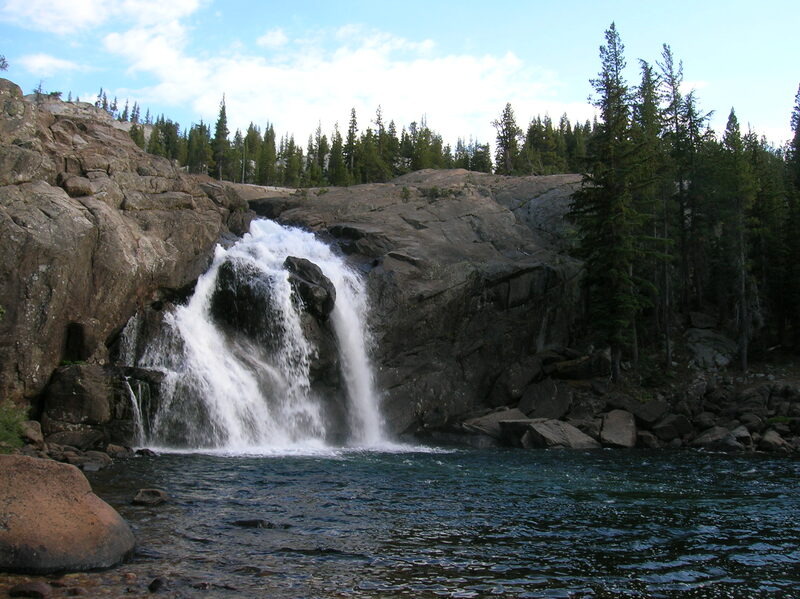 A popular day trip continues from Glen Aulin down the Tuolumne River to see Waterwheel Falls. All of the proposed alternatives address the issue of wastewater disposal, and replacing the composting toilet at the backpacker campground near Glen Aulin. Other alternatives propose changes ranging from closing Glen Aulin HSC completely (Alternative 1), to converting the HSC to a seasonal outfitter camp with no permanent structures except for a composting toilet (Alternative 2). Alternative 3 would continue to restrict water usage to 600 gals/day, while the preferred alternative reduces the allowable usage to 500 gallons. 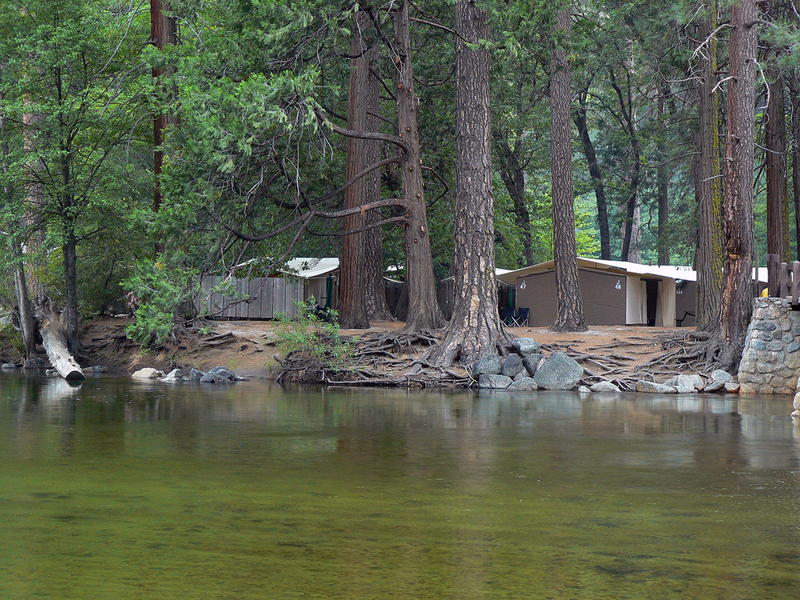 Other changes to the High Sierra Camps, such as the Merced Lake HSC, can be found in the Draft Merced River Plan. There are also numerous other changes being proposed in the TRP, including changes to parking, location of the visitor’s center, and day-trip mule and horseback rides. What do you like and dislike about these proposed plans? For more information visit the NPS website, and be sure to comment. We’d love to hear them here, but to be part of the official process, submit your comments via one of the following channels. Does Ice Skating Belong in Yosemite? Ice skating in Yosemite has been around since the 1920s, and was even part of an unsuccessful bid to host the 1932 Olympics. Thousands of people enjoy circling the ice in the winter with views of Glacier Point and Half Dome. Journalists have listed it as one of the world’s best ice rinks. 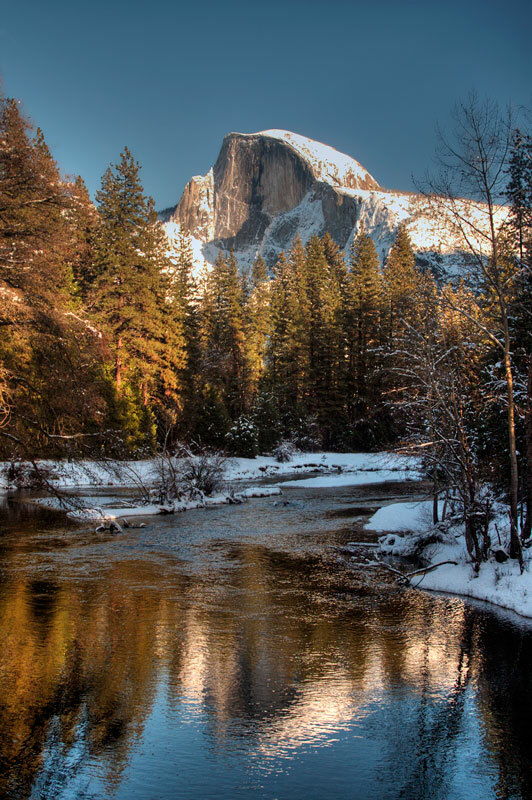 As part of the Merced River Planning process, the US Ninth Circuit Court of Appeals directed the National Park Service to consider all commercial services within Yosemite Valley and eliminate services that are not essential to the Yosemite experience. In all but the No Action alternative (Alternatives 2 – 6), the ice rink is earmarked for removal. On peak days in Yosemite Valley, traffic and parking can be a challenge. The Merced River Plan outlines a few options to improve parking and traffic flow to give people a better experience when they visit. Increase day-use parking spaces in Yosemite Valley (+5%). Improve traffic circulation by building underpasses and roundabouts in key locations like day-use parking and across from Yosemite Lodge at the Falls. Accommodate approximately 19,900 visitors per day in East Yosemite Valley, compared to current peak visitation of about 20,900. Continue to manage overnight-use capacity through wilderness permits and reservation systems for lodging and camping. Manage day-use capacity for East Yosemite Valley through traffic diversions and monitoring. Create an additional parking area in the west end of Yosemite Valley to accommodate overflow traffic. Provide additional public transit and free shuttle bus services, with routes extending further west to include locations like Bridalveil and the new proposed parking area. The name for the recently released document is quite a mouthful, “Alternative Concepts Workbook for the Comprehensive Management Plan for the Merced Wild and Scenic River Plan” (MRP), but more simply, it is the first chance for all of us to see what the park has come up with after the initial round of looking at scientific findings and public comments. As the NPS says in their official press release, “The MRP will guide future decisions about transportation, camping, parking, lodging, employee housing and other administrative uses, restoration, and set user capacity – most notably within Yosemite Valley – and will establish the management strategy and actions for the next 20 years by modifying the General Management Plan.” The planning team has come up with five different concepts ranging from those that emphasize a self-reliant experience, to those that aim to provide more services and experiences for people visiting the park. For example, the number of campsites are increased in 3 of the 5 concepts, while the number of lodging is decreased in all but one. Which alternatives do you prefer? Do you see any problems with any of the alternatives? Have they overlooked something? They are looking for your feedback. Once we’ve had a chance to look at this draft, the park service will further refine these ideas into the Draft Environmental Impact Statement, which will also be open to public comment. To find out more about what is happening with the MRP, you can download the workbooks, read more on the NPS planning page, or attend a workshop, site visit, or webinar. Site Visits will provide an opportunity to discuss proposed actions “on-the-ground” at the locations where they may be implemented. They will be conducted in conjunction with the Workshops outlined above. Visitors are asked to wear comfortable walking shoes. There will also be two webinars conducted that will review the draft alternatives. These will be held on Tuesday, March 27, 2012, at 10:00 a.m., and on Wednesday, April 11, 2012, at 6:30 p.m. People can participate in the webinars by logging into yose.webex.com.